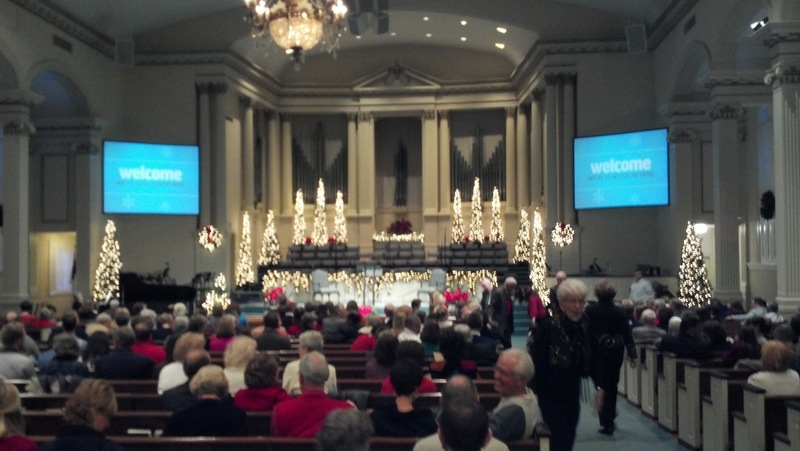 Having visited 48 churches in 2011 and with only one week left and two church visits to go to hit my goal of 50, I figured I would go for a double dose of Christmas cheer and attend both the Christmas Eve and Christmas Day services at Brainerd Baptist Church. After doing a little research, I figured out that the “ChattanoogaChristmasEve.com” (FYI…website no longer active) yard signs that were scattered about every five feet throughout the city of Chattanooga (slight exaggeration) were actually for an event at the Chattanooga Convention Center that was being put on by…you guessed it…Brainerd Baptist Church. Cool. 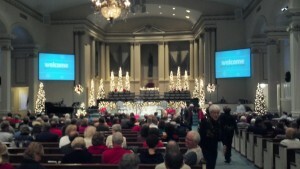 I got to go to a big community Christmas Eve service and count it as a church visit (I make up the rules as I go). So on Christmas Eve, Laura and I joined the streams of people heading in to the Chattanooga Convention Center to celebrate the birth of Jesus Christ. There were various stations in the main hallway with free concessions that included coffee, hot chocolate, and cider, so we filled up a cup of coffee and headed into the hall where the event was being held. The good thing (and bad) about the Convention Center was that it did not feel “churchy”. I say good, because people who do not feel comfortable in church (for whatever reason) would probably be much more comfortable in a neutral setting such as this (and bad because being in a church can create more of a spiritual connection for others). There was a stage at the front that held a choir of at least 50 or more, plus a band and orchestra. The choir size was impressive considering large choirs are becoming more and more rare as churches now have electronic amplification equipment which allows a small band to make a big sound. 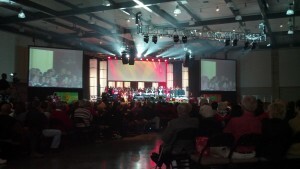 The evening kicked off with “Little Drummer Boy” and “Joy to the World”, which were both performed very well, but in the expansive space of the Convention Center hall it seemed like a little bit of the “oomph” was lost (that’s just me being picky). I wondered if a venue like Memorial Auditorium wouldn’t be a “warmer” place to hold this type of event, but I figured there were probably good reasons for choosing the Convention Center and let it go. After the music, Robby Gallaty came forward on stage and began to present the Gospel message very plainly and clearly with a deep, velvety, calming tone of voice. He spoke about God’s grace and shared Scripture from 2 Timothy 1:8-10. He spoke of God, mankind, Christ, and the response of man to the life of Jesus Christ. He pointed out that those who follow Jesus do so because it is the only religion (I prefer “Way” over “religion” because there are honestly only two religions in the world…God’s Way, which is Jesus, or man’s way, which is everything else) that was founded by someone who rose from the dead. Pastor Robby then talked with conviction about how, as the Church, we are called to be Ambassadors of God’s Grace. With that point he transitioned to talking about how 2011 had been the best year in the history of Brainerd Baptist Church, and how among other areas, they had grown and prospered financially. They decided that as a way to bless the community, they would infuse $26,000 through individual gifts entrusted to those in attendance. A representative from each household was given an envelope containing either a $20, $50, or $100 bill, which they were encouraged to double by matching the amount if they were able, and then after praying about it to give it to someone in need. I thought this was a unique way to touch the lives of people in the community and in the church, and to let people who may not normally (either by choice or circumstance) be a charitable giver experience what it is like to help someone in need. 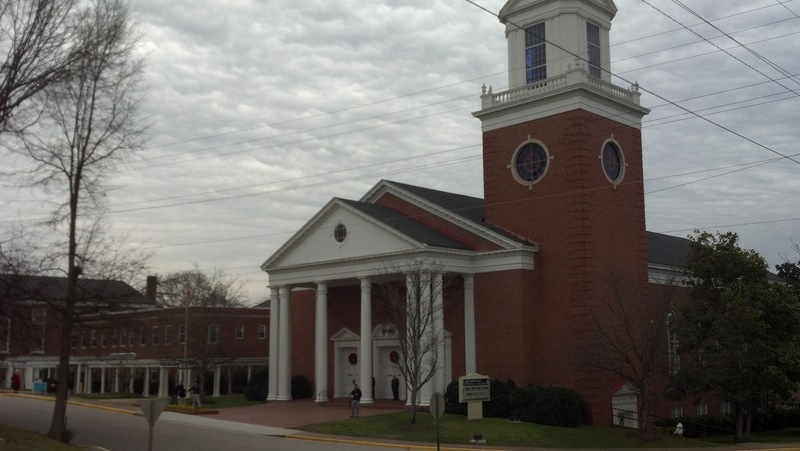 Some of the stories from people who participated have been posted on the Brainerd Baptist website, and I’m sure there are plenty more being told from person to person around the community. 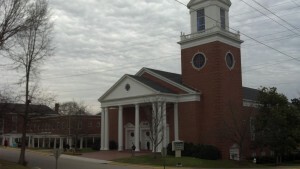 The next morning, Laura and I went to the Christmas service held at Brainerd Baptist Church. Every facet of this service felt more traditional, with the white and gold sanctuary decorated with splashes of color from poinsettias around the stage, lighted Christmas trees and wreaths, and a huge classic chandelier hanging in the center of the room. There was a prelude of piano music to the service and the worship music was classic and simple, consisting of Christmas hymns led by a song leader (I’m assuming the choir, band, and orchestra had the morning off to be with family). After a Scripture reading from Luke and a prayer, Senior Pastor Robby Gallaty shared a different message with the congregation than the one he had preached the night before. He announced the title of his sermon, “gifts that keep on giving”, and after reading Matthew 2:1-12, he began to point out several misconceptions about the Bible story of the wise men. Most manger scenes show the Magi being present, but it is obvious from verse 11 that they arrived at a house where Mary and Joseph were staying, not at the manger where Jesus was born. There is also no indication that there were three Magi, only that there were three gifts given. The gifts, Pastor Robby explained, were very significant. Gold represented the royalty of Christ, incense identified him as High Priest, and myrrh was a burial spice (as referenced in John 19:39) which foreshadowed his death, which was in all actuality, a gift to us. He pulled several lessons from the story of the Magi, such as the fact that they remained nameless so that the centerpiece of the story is Jesus. He also spoke of their journey of faith, following a star that they knew would lead them to the King spoken of by the prophets, and then pointed out that the Magi only worshiped Jesus but not Mary or Joseph. At the end of his sermon, Pastor Robby encouraged everyone to take some time for self-reflection and he ended with an invitation to come forward for anyone who desired to make a public profession of their desire to follow Jesus for the first time. The Christmas service was simple and straightforward after the big production at the Convention Center the night before, but neither lacked purpose nor significance. Where the Christmas Eve service left off after dealing with the power of the gift of God’s grace, the Christmas morning service came full circle by reflecting on the Giver and receivers of the gift. The gift of Salvation is of no benefit if you do not take the time to know and love the One who gave it. Likewise, the gift is not to be kept to ones self, but shared freely with whoever will receive it. Isn’t the best kind of gift the one that keeps on giving? Each day that we walk in His salvation is a new gift. Each time we are able to share God’s love with someone and realize the compassion for humanity that His Spirit has filled us with is a new gift. Each time our faith is challenged, each time we are attacked, each time we are subjected to ridicule, each time we are asked to compromise our beliefs, each time we are sold false doctrines, each time we are subjected to cruelty, each time we are persecuted because of His name and persevere is a new gift and another step to being sanctified in His image. His Grace is the gift that keeps on giving, and I pray that if you have not received it that you would take this opportunity to begin a journey and follow a star by faith. I promise He will always love you and He will never let you down. For anyone who has been a part of the ChurchSurfer journey over the course of the last 14 months, I would like to thank you and let you know that I am honored that you took the time to join me in exploring local churches. Although I will not be visiting a different church each week anymore, there will be more ChurchSurfer to come. The concept may change a little, but the purpose will remain the same…to glorify God and encourage people in their faith. I have been following your journey ever since you visited our church…Trinity Lutheran…this past year and I look forward to seeing how you continue your quest in 2012. Congratulations on accomplishing your Churfing goal! I’ve lurked over the last year like a bystander to a marathon. It’s great to see you finish. As you quote on your About Page, “as iron sharpens iron, so does brother sharpen brother” – I think you touched many on this adventure. Thanks for the kind comments Doug. It has been a great experience and if someone else received something positive from following along, it makes it that much better! Josh, I have some excellent ideas for continue the mission of this blog. The first idea is to have other people do the churfing from time to time and write guest posts. The second idea is for you to do more ”unique” churfing but only to attend special services like Sunrise Easter services, Sunday Night church experiences, and Wednesday night church experiences and compare them to how they are often different from the Sunday morning services. That way you can attend the same church every Sunday Morning but go out and experience other types of services on Sunday night/Wednesday nights and still give some new content for here that’s different.